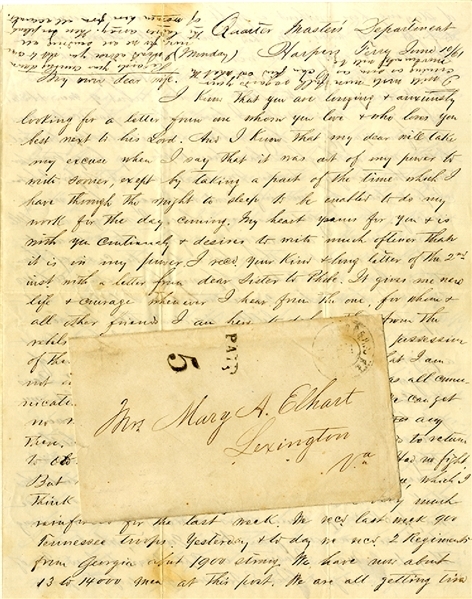 War-date Confederate soldier Autograph Letter Signed by Adolphus Elhart, Major, 1st Virginia Cavalry, who served as Paymaster of Stonewall’s Brigade in 1862, 4pp. quarto, Quarter Master Department, Harpers Ferry, June 10, 1861, with cover addressed to his wife in Lexington, and reads in part: “...all communication between here & Wheeling is cut off. We can get no mail from that direction...We have been very much reinforced for the last week. We received last week 900 Tennessee troops. Yesterday & today we received 2 Regiments from Georgia, about 1900 strong. We have now about 13 to 14,000 men at this post. We are all getting tired of staying here without a fight. They are all anxious to fight & get home. We had several little skirmishes....At a little known town viz. Philippi out in the Western part of the state, we lost about 9 men killed, about 70 on their side...Don’t be uneasy about me, my darling. God protects us every where...” More. Fine condition.